"The only thing you've got in this world is what you can sell," Charley told Willy Loman in Arthur Miller's play, Death of a Salesman. The technological disruption that is happening in the real estate sector will go far beyond taking away “what you can sell”; it is set to radically transform the real estate profession. Recent research indicates that it is not just brokers but the entire real estate industry that has to rethink how new technologies as well as shifts in demographics and behaviour will impact upon real estate jobs, skills and business models. 1) A new kind of consumer requires new ways of doing real estate business: According to Norbert Winkeljohann, PwC Germany, the “sharing economy” - where people rent or borrow goods rather than buying or owning them - could generate revenues of US$335 billion by 2025. This development will eat up revenues and market share from the traditional real estate business. While young people have tended to drive the popularity of services like Airbnb, at the other end of the spectrum, the ageing of societies will challenge the way we think about real estate. We need to cater to the needs of an ageing population with new ideas for assisted living, accessible facilities, and creating a healthy environment that keeps the elderly out of hospital as long as possible. As consumers become less predictable, psychographics – where real estate demand is mainly driven by consumer personality, values, opinions, attitudes, interests, and lifestyles - are the new demographics for determining real estate success. 2) Migration and urbanization are proceeding apace – and we are not prepared: There is an increasing need for affordable housing and urban infrastructure - from transport facilities to telecommunications - that lets all people succeed, but essential projects are often not carried out due to a lack of funding. Across all sectors of economic and social infrastructure, the global infrastructure investment gap amounts to at least US$ 1 trillion per year, which corresponds to about 1.4% of global GDP. And according to a McKinsey report in 2014, a third of urban dwellers - 1.6 billion people - could struggle to secure decent housing by 2025. The United Nations predicts that 65% of the developing world and 86% of the developed world will be urbanized by 2050. Rapid urbanization is already having substantial economic, environmental and health effects on urban communities. House prices and social tensions are expected to increase, while "liveability" and a sense of community will diminish. The real estate sector can help find solutions: developing new social housing concepts, for example. The sector could also propose regulation policies and innovative incentive models, such as land value capture, a taxation of the windfall gains when land owners benefit from publicly funded infrastructure. While much attention is being paid to urbanization, the existing fabric of many cities is deteriorating rapidly and this has to be addressed. The quality of infrastructure systems, such as transportation, utilities and telecommunications, is the most important factor in real estate investment and development in cities, according to a survey by the Urban Land Institute. Strong telecommunications systems, including high-speed internet, topped the list, along with good roads and bridges, and reliable and affordable energy. Infrastructure plays a critical role in guiding real estate activity and economic development, and reinforces the need for close coordination between land-use planning and infrastructure planning. d. The workforce is ageing as retirement ages are likely to be further pushed back, an organisation’s employee profile is likely to contain more diverse age groups. e. Automated systems require higher skill levels for entry-level positions. Income growth will be associated with increased educational and skills levels, as well as growing competition. Low skilled jobs are being offshored or automated. f. Employment growth in the service industries is likely to continue into the future as we move to a knowledge economy. Service sector jobs requiring social interaction skills and emotional intelligence will become increasingly important. 4) Real estate as the solution – not the problem: According to a recent World Economic Forum Report, the real estate sector consumes over 40% of global energy annually, 20% of total global greenhouse gas emissions originate from buildings, there is a projected 56% increase in building CO2 emissions by 2030, a 7% increase in proportionate share of global GHG emissions is expected by 2030, and buildings use 40% of raw materials globally. It is the largest global consumer of resources and raw materials. Therefore, the real estate industry has an obligation to demonstrate leadership as the solution provider in finding answers for the biggest challenge of our generation – climate change. No challenge poses a greater threat to future generations than climate change. In the quest for healthy, affordable and sustainable communities, real estate has an increasingly important role to play by championing sustainability, embracing the circular economy and promoting smart solutions for the built environment. Real estate is central to urban development, consumes physical resources and is a significant source of emissions. Equally, it is central to the goal of creating an environmentally sustainable future. 5) Location, location, location. Has the magic word lost its power? 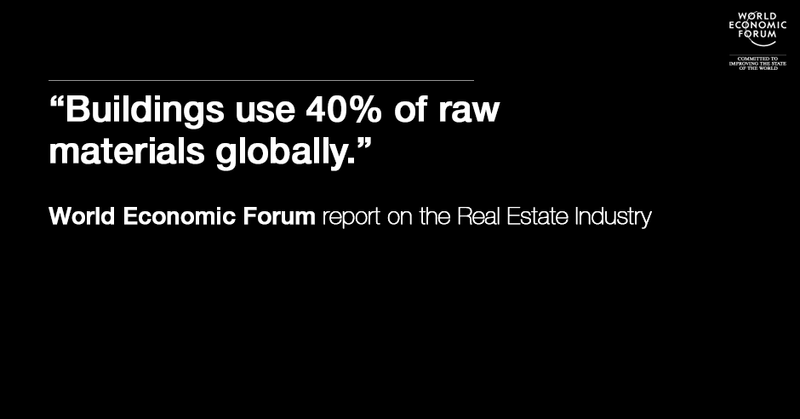 Business Innovation will be driven by redefinitions of real estate space. The need for office space is already changing dramatically as Julien Smith, cofounder and CEO of Breather, an Airbnb-like company for office space, pointed out by discussing the factors that are disrupting the idea of traditional office spaces. Increasing interconnectivity, mobility and work flexibility will have an impact on property prices in urban centres. As one answer to the urbanization trend, live-work space integration solutions will reduce space waste as will do self-driving mobility: If you totaled up all the land devoted to parking in the US, it'd be roughly 6,500 square miles, bigger than Connecticut. There is tremendous potential to use space more effectively: Currently, typically around 40 to 50% of office real estate is not being used during working hours – if you consider night hours and weekends total utilization rates can be as low as 10%. Similar, utilization inefficiencies can be observed in any other real asset class including housing. The World Economic Forum’s Global Agenda Council on the Future of Cities recently ranked (Digitally) Re-Programmable Space at the top of their Top Ten Urban Innovations. 6) Virtual space versus real estate: Hyper-connectivity has changed the real estate game. Location is still important, but in an age of improved mobility for businesses and customers, the relationship and interdependence between physical and virtual spaces has changed drastically. As technology continues to evolve, its impact on the real estate industry will get even stronger. Virtual communication, virtual reality and virtual modelling such as Building Information Modelling (BIM) in real estate will change the business or even the demand for real estate. 7) Exponential technology revolution meets business innovation: 3D printing, mass customization, new construction materials and methods, monopolistic digital procurement platforms (a scenario where property and real estate related products and services are being traded by a digital platform provider exerting a natural monopoly), supply drones, collaborative robots, iBeacons, big data mining, wearable tech, augmented reality, etc. – the list is long and the opportunities for the real estate sector even longer. Over the past decade, real estate and its business models have already been substantially influenced by online market developments. Such developments for example included e-commerce and a growing demand for data centers and logistics real estate space and with it the shrinking demand for retail space. High streets have dwindled, Amazon warehouses grown. New technologies such as the internet and its infrastructure have introduced disruptive competition to the traditional regional/local market by changing conventional supply-and-demand patterns. 8) Deja-vu? Real estate bubbles and systemic risks: There is growing uncertainty over asset price management. Since the global financial crisis, economists have paid particular attention to what they really know about real asset bubbles. When the global equity and real estate markets hit their lowest points in March 2009, $34.4 trillion of global wealth was destroyed. US households lost almost $8 trillion in the stock market, on top of the $6 trillion loss in the market value of their homes. In the aftermath of the crisis, trends in real estate markets have become increasingly hard to predict. To safely navigate this challenging environment, adopting a long-term perspective remains imperative. Policy-makers are currently debating whether asset-pricing dynamics can, or should, be managed with the public interest in mind. Experts from the real estate community can help to better understand the underlying mechanisms of asset pricing and the root causes of asset bubbles. Insights will help to understand how asset bubbles can be prevented and the consequences managed. 9) Who still needs traditional access to funding and finance? New types of investors and financial services innovations - so-called FinTechs - will transform real estate. FinTech companies are using internet technology and AI algorithms to disrupt the financial industry. By cutting out the middle man such as banks or investment managers and lowering costs, they're able to make financial services far more efficient and consumer friendly. According to Bloomberg, robo-advisers, which use computer programs to provide investment advice online, typically charge less than half the fees of traditional brokerages, which cost at least 1 percent of assets under management. The asset classes managed by robo-advisers include domestic equities, foreign equities, fixed income securities as well as real estate assets. Consulting group A.T. Kearney predicts that these novel services will surge and robo-advisory will become a $2.2 trillion market by 2020. Crowdfunding has shown how technology can help investors and operators to raise capital, but its adaptation in real estate will significantly shake up how investments are made in the future. 10) It's about trust: urban governance and transparency: The real estate market is increasingly impacted by government policies. Government policies and urban management can significantly affect the development of real asset markets and the built environment. In a globalized world, it is hard to anticipate how monetary, fiscal and planning policy, industry regulation and cross-border legislation will affect markets, and, as a result, the development of cities. Municipal leadership becomes more important as cities grow in size and influence. It is hoped that the real estate industry can help to strengthen such governance by highlighting successful policies, proposing intelligent urban planning, and tackling issues such as transparency and corruption. A better alignment of urban management and integrated planning is needed, and is noticeable by either over regulation in developed economies and absence in developing countries; the management of cities, given their increasing complexity, is a major issue.